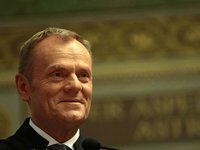 President of the European Council Donald Tusk has praised the efforts of Ukrainian President Petro Poroshenko in reforming the state, noting the high reputation of Ukraine "not only in Brussels but also in all capitals of Europe." "I also really appreciate your personal role, Mr. President. You also have good reasons to be proud. This is not just my personal opinion. Your reputation and the reputation of the whole country is very high not only in Brussels but also in all capitals of Europe. You have deserved such a reputation," Tusk told Poroshenko while meeting in Kyiv on Monday, February 18. The European official also highly appreciated the Ukrainian people's efforts to resist Russian aggression. "This is the first time in our common European history, when such resistance, courage and pragmatism were demonstrated. Because I feel, and this not only my opinion, that you are heroes and pragmatics. It's unique," he said.